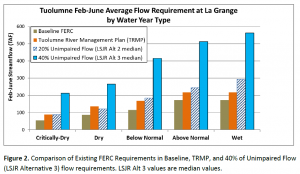 The State Board’s approach in its ongoing update of the Bay-Delta Plan is to establish a flow requirement in the Stanislaus, Tuolumne, and Merced rivers of 40% of the February-June unimpaired flow. This would establish a real water budget for the San Joaquin River and its contribution to the Delta. At CSPA, we’ve said that this water budget is in fact too small to recover fish species in these rivers and the Delta. On the other hand, what the State Board proposes is about double what water users in the San Joaquin watershed have proposed. CSPA pointed this out before the State Board in oral comments on November 7, 2018, at the meeting where the State Board was scheduled to adopt the San Joaquin flow portion of the Bay-Delta Plan. A letter from Governor Brown and Governor-elect Newsom persuaded the State Board to delay yet another month (see story here) in order to allow more time for “voluntary agreements” to develop. The Director of the California Department of Fish and Wildlife (CDFW) presented the Governors’ letter and the case for more time to reach agreements, and spoke in general about water budgets without talking numbers. Sorry, but those of us who’ve been working ten years to achieve water budgets get just a little “hung up” when those water budgets get slashed by a half or two-thirds. When academics and policy institute specialists weigh in at 11:59 pm to support “voluntary agreements” founded on those amputated budgets, those in the trenches get more than a little “hung up.” These agreements are being touted by Director of CDFW as well as the Director of the Department of Water Resources (DWR) and the water user community in direct opposition to regulatory process, and in particular to how that process is setting the environmental water budgets that are supposed to be the answer. Mount and Hanak’s lack of situational awareness of how dicta from a policy institute influence actual political and regulatory process is unforgivable, especially when the stated interest is river and ecosystem protection. In a word, the practical effect of their intervention is to support the water users and oppose the State Board, not to leverage the regulatory authority of the State Board, but to undermine it. Perhaps the major reason that there haven’t been any voluntary agreements after six years of negotiations on the San Joaquin is that the water users have never taken the State Board’s proposed flows or the interests of environmental and fishing groups seriously. The water users, including the City of San Francisco, have told environmental and fishing groups that a small increment of water above existing flows will meet their interests. As the supposed sweetener to a bitter brew, they’ve proposed non-flow measures that are timid in scope and scale, often financed by selling the water they shouldn’t have diverted in the first place. For their part, CDFW and the California Department of Resources have not leveraged their position to achieve substantial increases in flow. Interested in a deal above all, they never conceived of an outcome where irrigation deliveries were substantially reduced. So of course they haven’t thought outside the box of the world of water, to imagine the scale of investment it would take to improve irrigation efficiency to a point where substantially mitigating large-scale reductions in water deliveries were actually possible. And none of the potential negotiating parties has had the vision to look at the Sacramento – San Joaquin – Delta hydraulic system as whole, with the possible exception of DWR and the Bureau of Reclamation, who want to take more water out of the system than they do today. Fundamentally, the approach does not conceive that there could be a business model for Central Valley water use that does not live off the water needed to restore public trust resources, or a funding source outside the conventional world of water and power sales. Finally, negotiations conducted behind the wall of a confidentiality or non-disclosure agreement lack credibility by virtue of secret process, but this never made enough difference to the negotiating parties for them to insist on daylight. Mount and Hanak tell us: “What matters more [than a “specific amount of water”] is putting in place a system for adjusting this allocation over time as scientific understanding about what works improves.” This primrose path is not new. Its previous incarnation was called CalFed, the grand deal of the 1990’s that circumvented the last update of the Bay-Delta Plan and substituted process for substance, “science” and “adaptive management” for water. The problem since CalFed and its implementing vehicle Water Rights Decision 1641 has not been lack of science. It’s been lack of water. It’s also been the fact that when the “flexibility” to make management decisions is faced with a choice between science and money, it’s resolved in favor of money. What’s lacking is not science, or a governance structure to implement it. What’s lacking is the political will to make difficult decisions based on science. The good governance, habitat improvements, science, and reliable funding that Mount and Hanak recommend are all important materials for a new business model for Central Valley water operations. But they must be built on a foundation of water. This entry was posted in Chris Shutes, State Board Bay-Delta Standards. Bookmark the permalink.